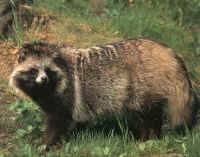 (Raccoon Dogs - Fur - 02) In this still we see the raccoon dog just about to hit the ground on his or her back and head. We usually refer to acts of deliberate cruelty as being evil. After watching this video, and seeing the way this and other men seem to enjoy inflicting pain and leaving the animals to suffer excruciating pain, we can only conclude that these men are totally evil and sociopaths. Anyone who buys fur is contributing to this suffering by keeping these despicable people in business. And anyone who wears fur is saying, "I agree. Keep on torturing these innocent animals. My selfish pride and vanity is more important."